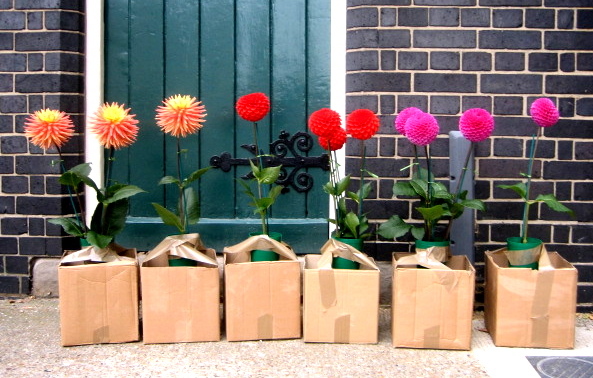 On my way back from Columbia Road this morning around eight o’clock, I encountered an anxious man getting out of a taxi in Buxton Street with these Dahlias in boxes. Today is the Spitalfields Show and Green Fair. I can never resist this annual event, chiefly for the compellingly bizarre contests, longest runner bean, largest vegetable, weirdest shape vegetable, best head made from vegetables etc etc. 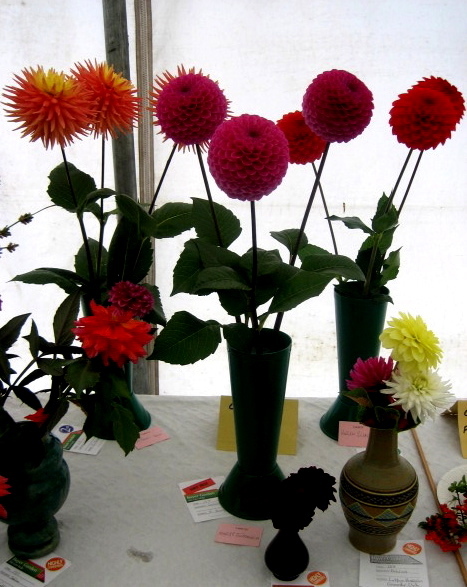 Then, in the produce tent, I was assaulted by this image of perfection – the mathematically regular Dahlias that I saw earlier in the day, which were grown by Mr Burgess. He need not have been anxious because they won First, Second and Third prizes in their category. Congratulations! Love the top pic, and well spotted .. you have a good eye … and that camera of yours must be part of your anatomy, always there, always ready.